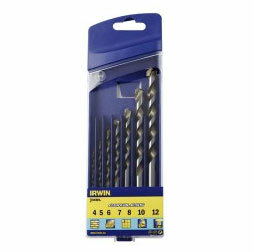 In this DIY tools review we check out the Irwin Cordless Multi drill bit set. This set of drill bits had been specifically designed for use in cordless drills with the aim of drilling through a range of materials, including masonry without having to use the drills hammer action. We had to check their claims that this idea would save the battery on most cordless drills. Demonstrating these cordless drill bits for this part of our tool reviews series was a great experience. The Irwin cordless masonry drills bits are designed for efficient and very quick drilling in breeze block, brickwork, concrete and even plastic and timber. They are designed to be used with cordless drills and hammer action is indeed not necessary. We found that they drill very quickly and although impossible to measure in demonstrations there is no reason not to believe that they are up to 60% faster than competitive drill bits. What Makes the Irwin Multi Bit so Much Better? They are designed with a single flute to ensure the dust can escape upwards rather than bind the drill into the hole as can happen with many cheaper drill bits. This ensures that the tip of the drill is always in contact with the bottom of the hole and always cutting. A diamond-ground carbide tip will last up to 20% longer than comparative drill bits used at a similar speed. A chrome vanadium body with high carbon content gives greater hardening and the chances of breaking or bending this drill bit are very small indeed. If you are interested in these drill bits and would like to find out more, check them out in our superstore. With their staggering range of special features coupled with the fact that they can be used in a traditional cordless drill without needing to use hammer action these drill bits are a must have for anyone’s tool kit. With a varied range of sizes of these drill bits they cover pretty much most of the DIY jobs you will encounter at home. Due to this you can see we have rated this set of drill bits with a well deserved 5 stars.